First feature I’d like to discuss about is the ability to create completely new App-V packages solely within AVE, something that previously couldn’t be done. In the past, should you had the need for even a simple App-V package, you had to resort into using Sequencer for that as AVE was only able to make edits to already-existing sequence. I guess it needs to be said at this point that by no means I am trying to downplay the Sequencer for what it is good for: capturing complex sequences wherein there is a lot of content added to the system. But what I am trying to illustrate here is the fact that when you do not have the need for that heavy-handed operation it would be nice to have an alternative. Software vendors or internal developers doing their own software packages directly to App-V format according to the spec. Granted, we have had Virtualization Encoder –product for many years now for this purpose as well; it is command-line based and can take a template as an input, which makes it even more suitable for software build process, but for some needs the GUI –based package construction is better (if there isn’t formalized build/packaging process, for instance). Packaging of simple applications not needing proper installation. I personally have seen a lot of applications distributed on the Internet, maybe not coincidentally them in many cases being open source variety, as a ZIP files or other archives without any real installers. If these applications’ installation procedure is simply 1) create a folder, 2) unzip the archive to the folder, 3) create shortcut manually; then why would we need to do any sort of monitoring for them? We don’t! And having been in the software business for some time now, I know that the customers will think of many more use cases for that sort of functionality that we couldn’t even being to anticipate for! Now, with AVE 2.3 you could easily accommodate these two (and more!) example scenarios by building up a completely customized package from scratch, without having to resort to App-V Sequencer. As an example, I’m going to do a complete packaging of one of my favorite open-source graphical tools, Inkscape, which is a good example also in that it was (still is?) very notorious at some point messing up with Sequencer’s monitoring by doing lot of I/O during installation (which filled up Sequencer’s active monitoring binary log very quickly and into very big in size, causing massive slowdown). 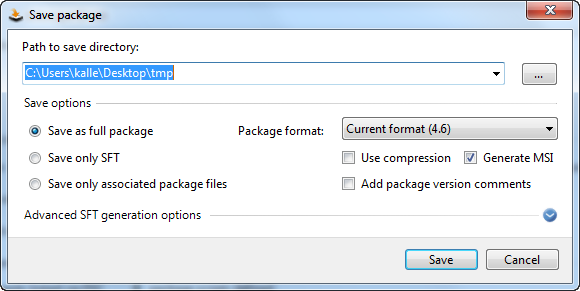 This will open up the basic package creation properties screen we can use to, first, name our package and, secondly, to select if we target it for 32-bit or 64-bit systems. Selecting 32-bit package equals what you would get out of running Sequencer on a 32-bit Windows (and likely a package that works both in 32-bit and 64-bit environments), whereas selecting 64-bit here would result package that is marked internally as being 64-bit and thus only safe to use on 64-bit client systems as well. To understand more on the bitness –related issues, see this earlier blog posting if you haven’t read it already. By default we will use the package name for the package’s internal root directory name (the so-called “asset directory”) as well, which is the one that will be mounted on the root of the client’s virtual (“Q:”) drive. If you want to, you can customize it to your liking (like, setting an explicit 8+3 format name). However, to conform with how the Sequencer 4.6 SP1 started doing things, AVE will also auto-generate a random short name version for the folder if you leave it to long and/or default (it’s just not displayed in this screen yet, but you can check it up later on from AVE’s UI). This ensures that there’s almost a zero possibility of clash of short names on the virtual drive, which wouldn’t necessarily be the case if we just use the default NTFS short name algorithm. Now we have an entry point available for the application, and should we need any other customization(s) like limitation of the operating system visibility (by default not limited) or changing the streaming path, these could be done now. 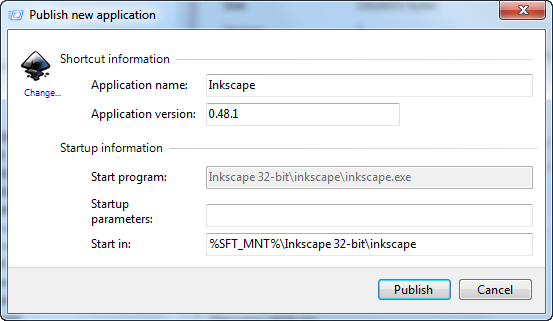 But since for our simple purposes this is all that is really needed, we can go saving out our brand new App-V package of the Inkscape program. 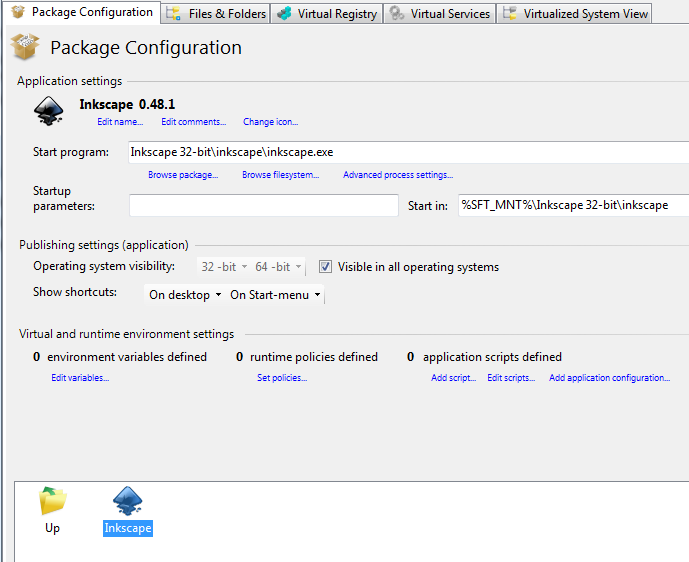 By default new packages are all in latest and greatest App-V package format, 4.6 (which include the 4.6 SP1 version as well), but if you are still using any older versions like perhaps 4.5 then you can change the format before saving and the resulting package will be fully compliant with that version’s Sequencers and Clients. This is, btw, yet another strong point in using AVE; you are not tied to any specific version of App-V as AVE is able to process App-V packages in all past and present formats. When the save is completed, we can see that the resulting package data is actually quite big (over 200 MB), but we could have trimmed it down by using internal compression for the SFT file. Regardless of the size, we now have a fully functioning App-V virtualized application, ready to be deployed to our clients and all without ever touching App-V Sequncer! Will you be doing a new version of AVE for App-V 5? I’ve been in this business for many years, and I see App-V 5 as a big step backwards for experienced sequencers/packagers. There were many scenarios over the years where I could rely on “advanced” features of the technology, e.g creating my own OSDs – with or without scripting inside. For sure, our currently stated App-V 5 supporting release will be in Q1/2013. And yes, I agree that in some regards 5.0 makes it harder for us packagers, although in Microsoft’s vision all the customization you likely did with OSDs in the past are domain of machine and user config file in 5.0.